I absolutely love this tank top. It is so unique, fun to wear and goes with everything. The lucky girl can wear it with a tulle, overflowing skirt for a holiday party or with a pair of shorts or jeans for everyday wear. You'll be surprised at how fast this knits up! The only trouble you'll have is making sure the recipient is patient enough to wait the few days it takes to make this masterpiece. Other color combinations I adore are Pink-a-Boo and Cotton Ball; Prairie Lupine and Alpine Lilac; Nymph and Cotton Ball; Jungle Green and Dusty Sage...the possibilities are endless. The colors used in the joining technique pictures are Perry's Primrose [MC] and Tea Rose [CC]. 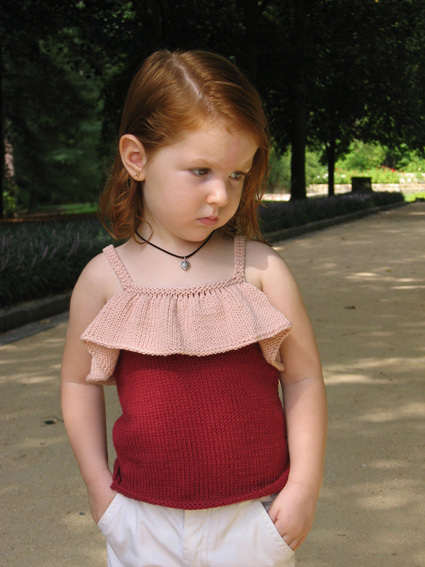 After you knit the body and ruffle, you will join them using a three needle joining technique. 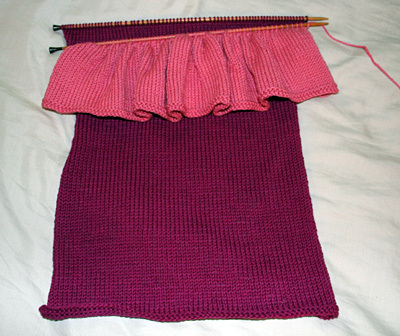 This technique is similar to a three-needle bind off, except the sts will not be bound off. 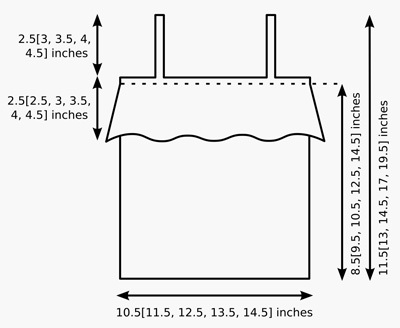 A detailed explanation is provided below in the section titled "Join Body and Ruffle". Using MC, CO 53[58, 63, 68, 73] sts. Beginning with a WS row, work in stockinette st until work measures 8.5[9.5, 10.5, 12.5, 14.5] inches, ending with a RS row. Break yarn and place sts on spare needle, with tip of needle oriented so that you are ready to work a RS row. Using CC, CO 104[114, 124, 134, 144] sts. Beginning with a WS row, work in stockinette st until work measures 2.5[2.5, 3, 3.5, 4] inches, ending with a RS row. Next Row [WS]: P1, [p2tog] to last st, p1. 53[58, 63, 68, 73] sts. Do not break yarn. 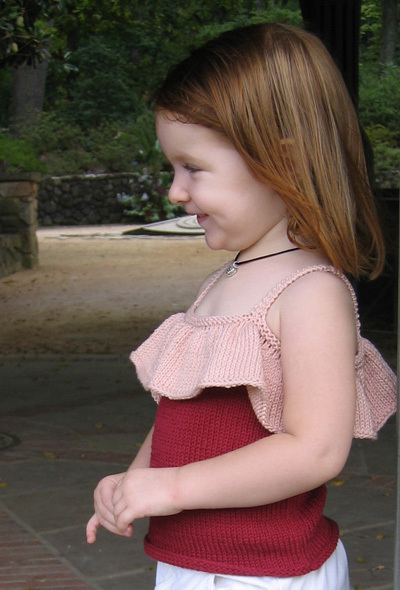 Place Ruffle in front of Body, with right sides of both pieces facing you (WS of Ruffle faces RS of Front - see pic above). The needles which hold the stitches of each piece should be held parallel in your left hand. Insert the right needle into the first stitch on each needle. Using CC, knit these 2 stitches together. Continue to join stitches in this way until all stitches have been worked. 53[58, 63, 68, 73] sts. Next Row [RS]: BO 13[15, 15, 17, 18] sts, k2[2, 3, 3, 3] (3[3, 4, 4, 4] sts on right needle), BO 21[22, 25, 26, 29] sts, k2[2, 3, 3, 3], BO remaining 13[15, 15, 17, 18] sts. Break yarn. Reattach yarn to first set of 3[3, 4, 4, 4] sts on needle, k3[3, 4, 4, 4]. Place remaining set of 3[3, 4, 4, 4] sts on hold on a small stitch holder or safety pin. Work in garter stitch until strap measures 2.5[3, 3.5, 4, 4.5] inches. Replace held sts on needle, rejoin CC and work second strap in the same way. Work Body, Ruffle, and Straps as for Front. Sew ends of straps together. Sew side seams of both body and ruffle. 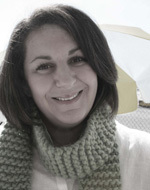 Christine has always had a passion for knitting and has been designing childrens' clothing for years. Originally from Australia, she called New York home for many years. 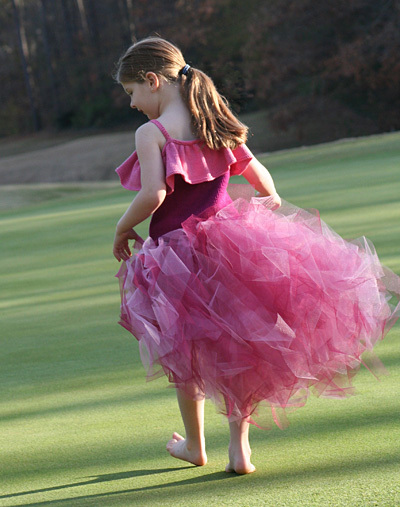 Christine, her husband and their three children currently live in Durham, North Carolina. Christine recently released her first knitting pattern book, Barefoot Knits, with co-author Paula Heist. She believes that knitting should be relaxing, enjoyable and that you should create to the heart's desire. To see more of their designs, please visit barefootknits.com.